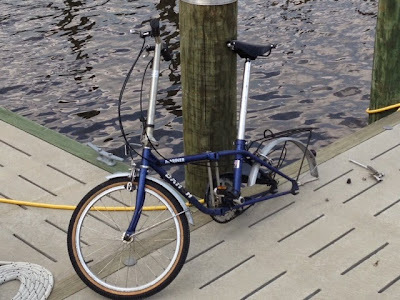 Day 3 (Plymouth): It's supposed to be 90F today, so we bolt early on the bicycles for a provisioning run, do a few chores (spinnaker out on deck for an airing out) and then head to the town museums as the heat hits. Plymouth is a very historic town. It was founded in 1787 as a port of entry (you could head up the Roanoke River to Virginia). As a result, there was a large Civil War naval battle fought here, chronicled at the Port O'Plymouth museum including a scale model of the Albemarle. At the end of the war, most of the town was burnt to the ground, but there are still some beautiful old homes here. They do reenactments every year ("We invite the Yanks down, charge them money, whoop their butts and send them home!"). Our next stop was the God's Creation Wildlife Museum. This is the personal collection of mounted animals of a local sportsman. No matter how you feel about hunting, this is an impressive collection of local and African animals. It was very educational and included a "touch" table. Very tasteful done and worth our time. Our last stop was the Maritime Museum across from the marina. (Leave yourself lots of time to have Brenda walk you through. She can tell you the history of the area better than anyone.) Back to the boat to crank up the air conditioning, do a few loads of laundry and watch another movie. Day 3: It's a lazy day and forecast to be cooler. The Captain has found some trim to paint. Brenda shows up at the dock at 10:00 am and invites us up into the lighthouse (on her day off) for more history lessons. This is a replica of the original lighthouse that was at the mouth of the river (it burnt down shortly after being built). 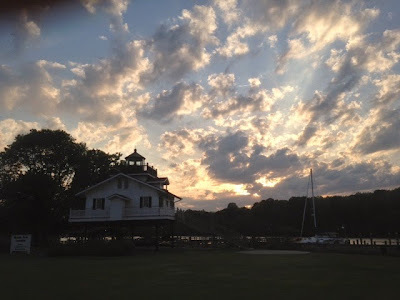 The second, original lighthouse (and last surviving of this style) is in Edenton. Day 3: I wake up to find the water level on the river has dropped significantly (the step off the boat to the dock is no longer a jump). Great news since we have to go back under (preferably) the 50 ft bridge again. We're up early and off by 7:00 am. 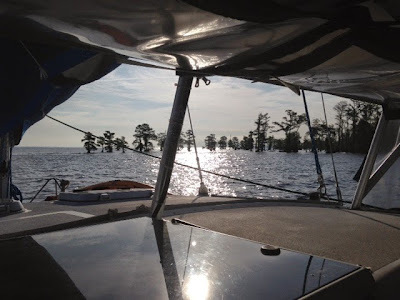 The winds were forecast to be out of the north (and we can't sail directly into the wind) so the plan was to motor the 14 miles across the Albemarle Sound to Edenton. 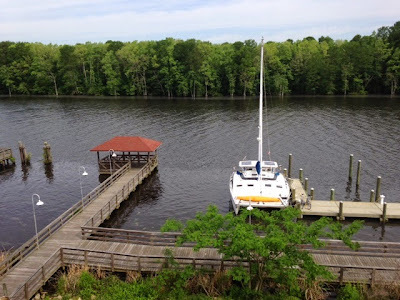 However, after an hour motor off of the Roanoke River, we discover the winds are more of a quartering wind so we unfurl the genoa for about an hour (and watch the winds slowly shift back to the north--and our track slowly wanders off our intended course). We finally give up and furl the genoa and motor into Edenton. Stats: Total time 2:42, total distance 14.1 NM, average speed 5.2 kts. We've been hearing about Edenton since the Dismal Swamp Visitor's Center. 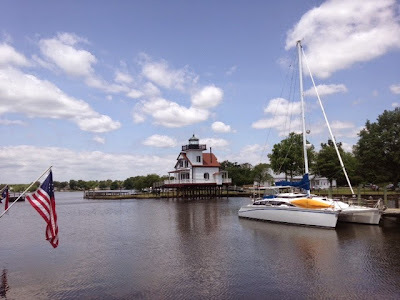 Every time we told someone we were going to spend some time in NC and the Albemarle, they told us you HAVE to go to EDENTON. Did it live up to the hype? Yes. A beautiful, quaint, small town on the water. Several excellent restaurants, a coffee house and anything else you need is here. Highly recommend. 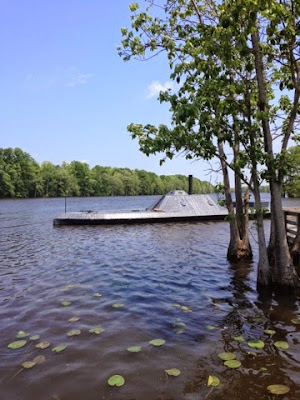 If you make one stop in the Albemarle, it should be here!